Eating right does not have to be complicated. By now, most of us know that the key is sticking with real foods—load up on veggies, along with some healthy fats. We also know that a food can be “low fat,” “high fiber” or “gluten free” and still be pure junk. Yet even the most knowledgeable eaters continue to miss out on plenty of ultra-healthy foods that fly under the radar. To dispel some of the common myths that prevent so many people from benefiting from these lesser-known foods, Bottom Line Health spoke with Mark Hyman, MD, a leading expert in nutritional wellness and director of the Cleveland Clinic Center for Functional Medicine. MYTH #1: Chicken is always a healthier choice than beef. The truth: There’s nothing particularly healthy about America’s most consumed meat—mass-produced chicken. While the chickens raised in your grandmother’s backyard ate a varied diet of grass, weeds, bugs and seeds, chickens raised on most commercial farms today get a steady diet of grains, corn and soy—often topped off with doses of antibiotics and arsenic. This diet fattens them up quickly, but it produces poultry that’s lower in inflammation-fighting omega-3 fatty acids and higher in inflammation-promoting omega-6 fatty acids. Grain-fed chickens also are lower in vitamins and minerals. What to do: Choose chickens that are certified “100% organic” and pasture-raised (not free range—which only tells you that the birds got outside, not what they ate). If you find that the cost of organic is an issue, “antibiotic-free” chicken is better than conventional but not ideal. As for that beef: It does have a little more saturated fat than chicken, but 17 large reviews of the scientific literature on saturated fat found no link between saturated fat and heart disease. That doesn’t mean you should go crazy with saturated fat—we’re still figuring out how much is healthy. But you should know that a nice grass-fed steak is more nutritious than the typical supermarket chicken breast. MYTH #2: Liver is bad for you. The truth: Even people who are comfortable eating steak, pork chops and pot roast may pause before trying that generations-old family recipe for liver and onions. But liver is much more nutrient-dense than muscle meat—that’s why when a lion takes down a zebra, it goes for the liver first. 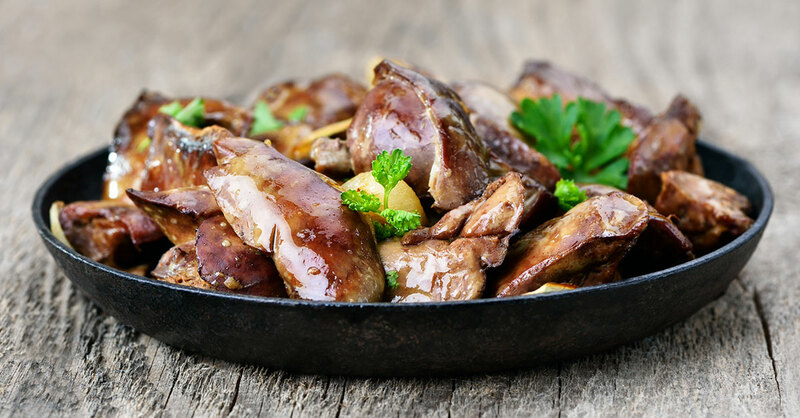 Liver contains ample amounts of vitamins A, B-12 and C, and minerals such as copper, iron, zinc, phosphorus and magnesium. It contains just as much protein as a beef roast or steak—and it’s cheaper. One reason liver fell out of favor is its high level of cholesterol. But research now tells us that eating cholesterol does not significantly raise our blood cholesterol (that’s why we now know it’s fine to eat eggs, too). What to do: Whenever possible, choose liver from grass-fed animals. And don’t stop there: Try other organ meats, such as hearts, kidneys and sweetbreads. Even though they may not sound appealing, they usually taste good! MYTH #3: Vegetables are boring. The truth: If you think veggies are dull, you are doing them wrong. The most boring vegetables, such as iceberg lettuce and white potatoes, are the least nutritious. The best choices are often the “weird” heirloom varieties you find from small farms—everything from purple carrots to knobby kohlrabi to dandelion greens. As you surely already know, you should fill at least half of your plate with a wide variety of vegetables in a rainbow of colors, and I recommend aiming for seven or eight servings a day as a minimum. Go mostly for locally grown and organic veggies for the best flavor. A good way to find more variety: Look to the sea. If you have eaten seaweed only as a sushi wrapper, you are missing out. Seaweed is not only rich in vitamin C and iron but also contains hard-to-come-by minerals, such as manganese and iodine, as well as anticancer compounds. You can find several forms of seaweed, including wakame, kombu and nori, in Asian food markets. And some stores sell roasted, lightly salted seaweed snacks you can munch on like potato chips—without the guilt. MYTH #4: Fresh fruit is always the best fruit. The truth: Fruit that is flash frozen at the peak of ripeness can be more nutritious than fruit picked unripe so that it can then be shipped thousands of miles. A frozen berry loses none of its antioxidants while it waits for you to open up your freezer and toss it into a smoothie or salad. A fresh berry does lose nutrients, and it can go moldy before you have a chance to use it. Frozen fruits are cheaper, too. If you buy frozen fruit, also opt for organic. What to do: Regardless of the fruit you choose, it’s important to not overdo it—especially if you are overweight or have diabetes or prediabetes. While fruit is a lot healthier than candy or juice, it still contains a lot of natural sugar and may raise your blood sugar. Two or three servings a day are plenty for anyone. MYTH #5: Peanut butter is a great protein source. The truth: Most commercial peanut butters are loaded with high-fructose corn syrup and industrial hydrogenated oils. Peanuts also can contain the fungus aflatoxin, which has been linked to cancer. An occasional spoonful of peanut butter or handful of peanuts is fine, but this legume (it’s not a nut) is not the nutritional powerhouse that tree nuts are. What to do: If you like nut butters, go for almond, macadamia and cashew butters made without added oils, sugars or other ingredients. See if you can find a store that grinds nuts into butter on the spot, but buy in small amounts so that the oils do not have a chance to go rancid. Store in the refrigerator. MYTH #6: Soy foods are health foods. The truth: Many foods containing soy are among the worst in our diets. The greatest offender is something you probably do not even know you consume—soybean oil, the oil of choice for most processed, packaged foods. It is the primary source of inflammatory omega-6 fatty acids in the typical American diet. Processed soy protein is also found in many manufactured foods—for both animals and humans—that are not very healthy. Avoid foods, such as energy and protein bars, fake hot dogs, burgers and shakes, with “soy protein isolate” on the label. Some fermented tempeh or simple tofu can be fine (if you buy organic to avoid pesticides and the GMO herbicide glyphosate) as well as steamed edamame, but there is no good reason to eat a soy hot dog. The soy protein isolate found in such products has been linked in some studies to allergies, cancer and dementia.